These pins are long sold out. But now, you can get the second generation of Jacki's Cheryl's Heart pins by ordering your purple Cheryl's Heart lapel pin here. Cheryl with Jacki's "Cheryl's Heart" drawing in October 1999. In 1999, IMMLY Founder Jacki Rickert presented her friend Cheryl Miller with a drawing she had created, which she titled, "Cheryl's Heart". Cheryl loved the drawing, and a picture of her with it (above), taken by Gary Storck of IMMLY, appears on the IMMLY site and was used on other websites, as well as for news articles about Cheryl. 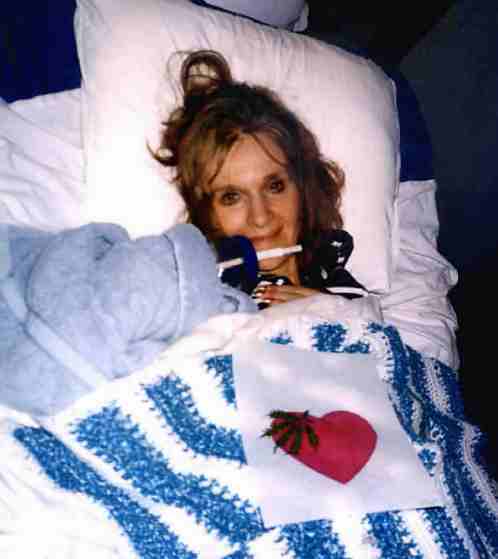 After Cheryl passed away last June, IMMLY joined with Jim Miller, NORML, Americans for Safe Access, SSDP, Drug Sense, DRCNET, DPA and other groups and individuals to present the Cheryl Miller Memorial Project on September 22-23, 2003 in Washington DC. To honor Cheryl and create a signature memento for the project, Jacki had her drawing made into a breathtaking "Cheryl's Heart" lapel pin for the event. Today, most of these limited edition pins are gone. 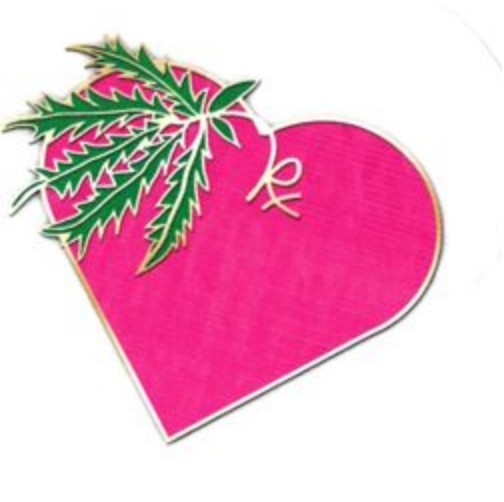 Jacki's "Cheryl's Heart" lapel pin. With less than 40 of these beautiful high quality pins remaining, we are offering IMMLY supporters a chance at your own "Cheryl's Heart" pin for a donation of at least $10, postage paid. Donations will help fund travel expenses for upcoming conferences and meetings in Washington DC and Virginia. A special commemorative memorial card, also designed by Jacki, in honor of Cheryl and other patients who have passed, accompanies each pin. Not only will you have one of these stunning pins, but your donation will allow IMMLY to once again meet with colleagues, elected representatives and others and represent your interests and obtain the latest medical cannabis information to bring back and share with you. IMMLY appreciates your support and interest. Without your help, we could not do what we do. Now you can support IMMLY and get a beautiful keepsake pin honoring a true hero of medical cannabis, Cheryl Miller, and all the other patients who gave the ultimate -- their lives -- in this unjust war. Don't miss your chance to own a piece of medical cannabis history while helping IMMLY. These pins are going fast!